Prince George, B.C. – The State of Emergency in B.C. will be extended for two weeks.The State of emergency was to end at midnight July 21st. Premier John Horgan made the announcement this morning, saying more funds will be made available to people and communities impacted by the wildfires. He has asked members of cabinet to establish a special task force to ensure all challenges being faced will be dealt with on a priority basis. This means evacuees will receive a further $600 dollars. The funding is within the $100 million dollars set aside by the previous Liberal Government . “In the days ahead we will be making further announcements” said Horgan. 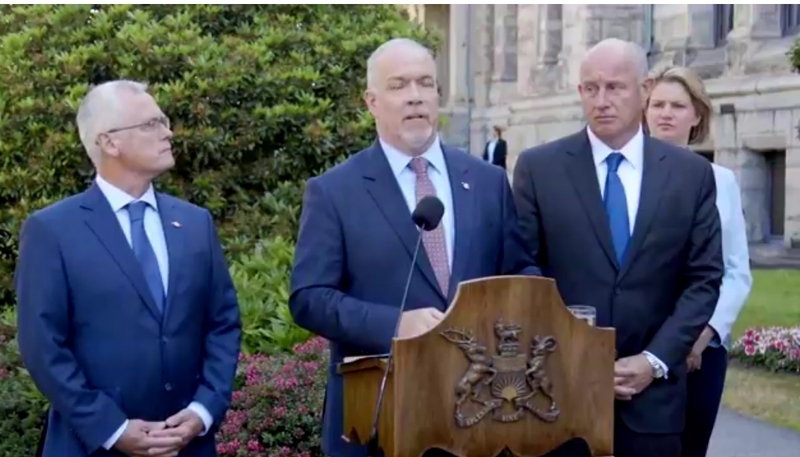 Horgan says he expects to be coming to the area at the end of the week, but in the meantime, Minister of Natural Resources Doug Donaldson, Minister of Public Safety Mike Farnworth and Parliamentary Secretary for Emergency Preparedness Jennifer Rice will head to the Cariboo tomorrow. “We are going to hit the ground running” said Horgan. Hit the ground running a deficit. Easy spending money hard paying it back. I think this is one of those times it’s money well spent. BUT…when he starts giving cheques to renters, and daycare for all, and living wages, and higher welfare and more money for teachers, and civil servants, that will mean less money for things like – BEING READY TO FIGHT FOREST FIRES. We have a base level of readiness – but it’s not etched in stone. We could, if we wanted to pay for it, have twice as much people and equipment on standby, or, we can stay the way it is, and spend that money on more feel good type of programs and just hope that this doesn’t happen again – though, with the Greens supporting him Horgan should be well aware of climate change and this is only going to get worst. His first order of business is to get that senior lady who fell through the cracks a new deep freeze and food he was talking about in his press conference in Kamloops. My power went out and I lost a few steaks and ice cubes, where do I sign up for my check? What are you referring to? Explain the background to your comment, please. If you were referring to my comment I wasn’t blaming the NDP for the budget we had, I’m expressing my concern they are so focused on feel good programs that an increase in the firefighting budget which appears in order, may not happen in order to fund other – while nice to have – not as crucial programs versus being able to deal with wildfires with an overwhelming response. Assuming we’re not going to mortgage the future, we can’t have it all, so we have to start making hard choices of protecting lives and property, or ??? To all the nay Sayers here is my finger. Put the ‘Cheers’ where the sun don’t shine, either that or find something more original. Move to England since you like that one word, fit right in! Wrong situation.